Williams-Yulee v. Florida Bar: The Supreme Court ponders judicial elections and campaign finance. 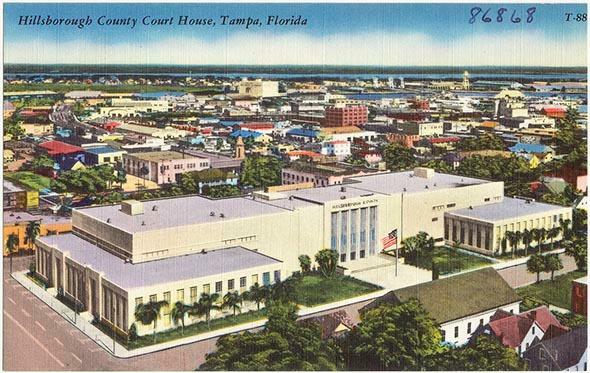 The Hillsborough County Courthouse in Tampa, Florida, circa 1940. The election of judges is one of the odder quirks of American democracy, and plenty of people—including many judges themselves—think it’s a pretty bad idea to force supposedly impartial arbiters of justice to grovel for votes. The dubious ethics of judicial elections hasn’t stopped 39 states from holding judicial races, but 30 of those states have at least tried to keep them as clean as possible by forbidding judges from personally soliciting contributions for their election campaigns. This seems like common sense: Judges aren’t politicians, and they shouldn’t be forced to act like them—especially when their donors could one day appear in their courtrooms. But the court that brought you Citizens United v. Federal Election Commission is in short supply of common sense when it comes to campaign finance regulations. On Tuesday, the justices heard the case of Williams-Yulee v. the Florida Bar, a challenge to a Florida rule barring judicial candidates from personally requesting campaign contributions. Lanell Williams-Yulee, a former candidate for county court judge in Hillsborough County, launched her campaign with a personalized mass-mail fundraising letter that asked for “an early contribution” to help her “raise the initial funds.” She promptly got charged with professional misconduct by the Florida Bar. The Florida Supreme Court upheld Williams-Yulee’s sanction. Now she’s appealing it to the Supreme Court, under the theory that the First Amendment protects her right to ask voters for campaign cash. Andrew Pincus, representing Williams-Yulee, begins the day with a swagger that suggests he knows he holds a winning hand, insisting that the Florida law be subject to “strict scrutiny”—the toughest level of judicial review. Justice Ruth Bader Ginsburg cuts him off. “Suppose the Florida rule was simply, no face­-to-­face solicitations?” she asks. In other words, what if Florida simply barred judges from personally and directly asking for money? “I think a state could adopt [that] prophylactic rule,” Pincus concedes—but only for judges. Pincus realizes he’s fallen for Ginsburg’s ploy: As soon as he admits that judicial elections can be regulated more thoroughly than legislative elections, he’ll drift away from the safe harbor of Citizens United and its ilk, which lifted restrictions on congressional campaign financing. “Let me step back,” Pincus says. The Notorious RBG has struck again. A few minutes later, Pincus hoists up the five conservatives’ favorite punching bag: the corruption argument. In Citizens United and McCutcheon v. FEC, the court’s right wing mercilessly bashed the argument that campaign contributions can be limited in order to prevent the appearance of corruption. The McCutcheon court insisted that the government can limit campaign donations only to prevent “quid pro quo” corruption—basically, bribery. Pincus knows this, and he knows that Florida’s law goes far beyond regulating bribery. Yet as soon as he mentions the corruption argument, Justice Antonin Scalia pushes him down a different track. “What about the interest in judicial dignity?” Scalia asks. Pincus is clearly puzzled; Scalia usually only uses the word “dignity” when he’s mocking Justice Anthony Kennedy’s belief that gay people deserve it. Still, Scalia presses his point. “I mean, there’s stuff we don’t let judges do that we let other people do. … There are certain things that are infra dignitatem, as we say.” Pincus awkwardly steers away from the judicial dignity argument, perhaps sensing (correctly) that the justice is laying a snare meant for somebody else. Ginsburg enters with the kill. “So Florida could regulate the already elected judges,” she asks, while their challengers could claim a First Amendment freedom to solicit funds? Pincus modifies his test; actually, only federal judges’ speech can be restricted, since they are appointed rather than elected and thus don’t have to campaign—but elected state judges must have total freedom of expression on the campaign trail. This, Kagan notes, does not make sense. “I would think it’s just the opposite,” she points out. Federal judges aren’t elected, so they aren’t particularly likely to bend rulings in favor of some wealthy contributor. Florida’s judges are elected, so the state should have a stronger interest in preventing them from personally soliciting money. Pincus can’t work his way out of the pretzel of illogic he’s created for himself. Next up is Barry Richard, representing the Florida Bar. Richard seems to know he’ll probably lose, but he takes some big swings in the process. Scalia once again dangles his “judicial dignity” line, and it’s now clear what he’s up to: The justice wants Richard to argue that Florida can restrict judicial campaign speech in order to preserve judicial dignity, so that the conservative justices can pounce on him and screech that judicial dignity isn’t a valid basis for limiting speech. Richard changes course. “Well, I think that’s true, your honor,” he says. “It’s not only Florida’s idea. I think it clearly reflects the culture of this nation.” His patriotic flourish concludes the colloquy smoothly. But Richard is in for choppier sailing, because Chief Justice John Roberts quickly launches into his predictable strategy of feigning a principled reason to strike down plainly reasonable campaign finance restrictions. “It’s self-evident,” Roberts begins, “particularly in judicial races, that prohibiting a form of raising funds is to the great advantage of the incumbent,” as challengers need more money to “get their own distinct message out.” (In the conservatives’ view, every attempt to prevent corruption in elections is actually the incumbents’ underhanded attempt to preserve their own power.) Quite the opposite, Richard notes: When judges can personally solicit funds, incumbent judges benefit, since they can leverage the power of their position to collect cash. Roberts, however, remains unconvinced. “You’re under a great burden,” he tells Richard, “in trying to figure out” how to keep judicial elections clean “without contravening the First Amendment.” Roberts is undoubtedly right about that. But what he seems not to understand is that it’s his court that put that burden there in the first place. That’s the painful truth unspoken in the Supreme Court on Tuesday. Florida, along with 29 other states, wants to help its elected judges escape impressions of favoritism. The states have done so by crafting a rule that barely restricts any true expression. Now five Supreme Court justices—none of whom have ever held elective office, all of whom are appointed for life—appear poised to strike these rules down. Florida’s “great burden” isn’t really the First Amendment. It’s a Supreme Court that has turned the First Amendment into a weapon for the wealthy.